God invites us to relationship each and every day. Retreats are a great opportunity to take time apart and disconnect from our every day lives, connecting with this call to relationship through exploration of spirituality, prayer life, and community. Join us for several days spent in community focused on building a closer relationship with God. Led by an experienced facilitator, our co-ed retreat will include a flexible schedule with time spent alone and in group. Our popular Women's Retreat returns once more. Join us for several days spent in community focused on building a closer relationship with God. Led by the Rev. Emily Olsen, Pastor of Christ the King ELCA in Gladwin, our retreat will focus on the stories of women in the Bible - both seen and unseen. The schedule for our retreat is flexible - with time spent both alone and in group. Young Adults are invited to spend a long weekend at Camp Chick as we form deeper relationships with God. Our flexible program will include time alone and with the larger group with a special focus on our connection with food and community. What's a young adult? We define it as someone college aged and older. If you feel like you're a "young" adult, you probably are. Retreat participants are welcome to bring their kids. Can I request to be in a cabin with friends? Absolutely. You can do so within the registration form. We will do our best to honor requests though we cannot guarantee the request. To reserve your space, a $50 deposit is required at the time of registration. This deposit is nonrefundable. Please check out weather (Presque Isle, MI, 49777) before arriving to ensure you’ve packed correctly. Bring a mix of items for warm days and chilly evenings. Pack comfortable walking shoes as many buildings are connected by outdoor footpaths. Pack Hiking shoes as we have many miles of trails on our property and surrounding. Bring a bathing suit and beach towel. Don’t forget an umbrella or rain coat! Bring an alarm clock, iron and hair dryer. Bring toiletries and your favorite pillow, blanket and linens. A fan may be helpful for comfortable sleeping as our accommodations are not air conditioned. Water bottle and to-go coffee mug. Because many of our outdoor seating spaces are simple benches, we do specifically recommend bringing some sort of outdoor chair to your own comfort. Retreat participants will stay in various cabin-styles in the camp. Some are lodges with a bedroom and kitchen and some are dorm style, with a bathhouse just a short walk away. Our sleeping units are comfortable but rustic. 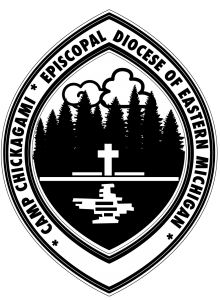 Camp Chickagami is for those who want to spend most of their time outdoors enjoying “God’s garden” and the fellowship of friends. Will you accommodate a food allergy? Your health and safety are our highest priority. If you have a food allergy, please include this information in your registration so we can make necessary arrangements. Feel free to contact our office before camp to discuss dietary issues to discuss how we can best accommodate you. For majorly restricted diets, we sometimes recommend that you provide our kitchen staff with supplemental food. How do I manage my medication? You will be in control of your own medication while on retreat at Camp Chickagami. If you require refrigeration, we can accommodate that request. Our infirmary has all required over the counter medications for other ailments that could come up while you’re on retreat. Sorry, dogs are not allowed at Camp Chickagami. Exceptions will be made for service animals. Please contact McKenzie for our full dog policy. There will be a WIFI hotspot available for us in Fletcher Dining Hall. Verizon and AT&T provide the best cell coverage; others are limited.